Here is a super quick tip that will definitely come in useful if you save lots of Render Setting and Output Module Templates in After Effects. Did you know these templates can be exported and transferred to other copies of After Effects? It is pretty simple to do and will save you loads of time recreating them from scratch. 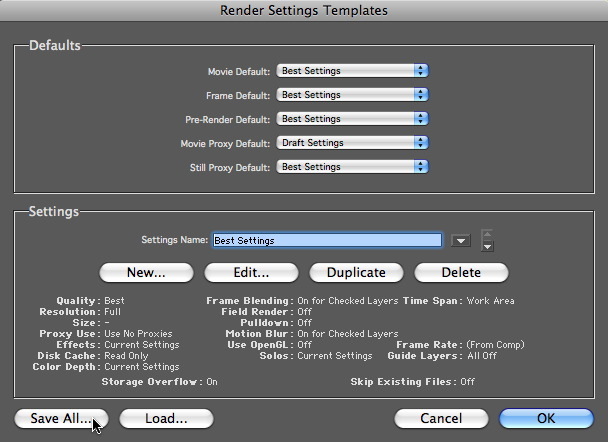 Open up the version of After Effects that contains the templates that you’d like to export. 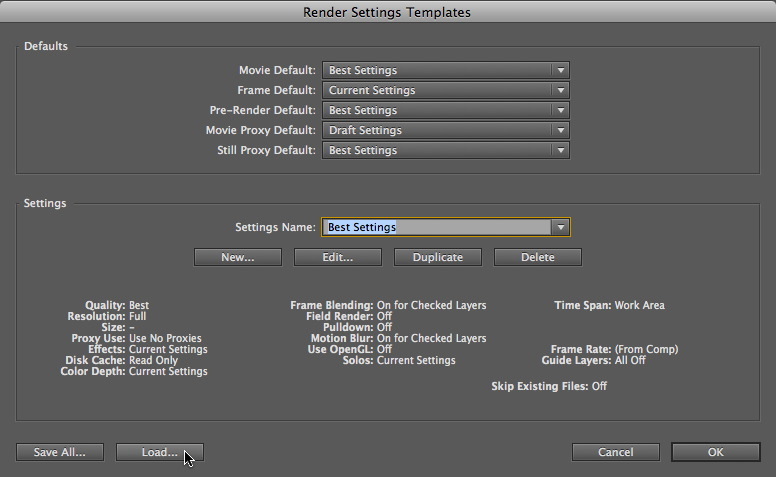 From the Edit Menu, choose Templates > Render Settings. Choose Edit / Templates / ….. In the dialogue that opens, there is an option to Save All in the lower left corner. Click here and choose a suitable save location on your hard drive. Now follow the same procedure for your Output Modules. The files you’ve saved will use the suffix .aom for output modules and .ars for Render Settings. Once you have saved both of these files, you can close this version of After Effects and open the version you wish to import them into. Again choose Edit > Templates > Render Settings. This time click the Load button and then locate your saved files. Repeat for Output Modules and you are ready to go. Nice and simple and definitely one to remember. If any names are the same then those templates won’t be imported, this stops you loading in duplicate templates. 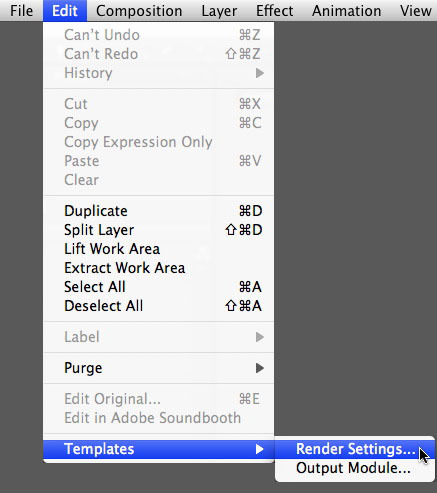 You can also use this method to send your render settings and output module templates to other users. Particularly handy if you need to ensure that staff working off-site, or even overseas, all use the same settings for their projects. Do you know any way to export your workspace in after effects (windows arrangements)? Is makes me crazy to work on another computer and reorder my windows before I start to work. Hi Grischa, I’m not sure how you can export your workspace unfortunately. Seems a bit of an omission by Adobe and worth requesting as a future feature. Quite an essential feature if you moving around workplaces all the time.